Dutch painter, born at Leiden on the 13th of January 1596, learned painting under several masters at Leiden and Haarlem, married in 1618 and settled at the Hague about 1631. He was one of the first to emancipate himself from the traditions of minute imitation embodied in the works of Pieter Brueghel and Savery. Though he preserved the dun scale of tone peculiar to those painters, he studied atmospheric effects in black and white with considerable skill. He had much influence on Dutch art. 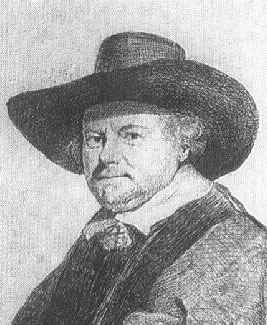 He formed Solomon Ruysdael and Pieter Potter, forced attention from Rembrandt, and bequeathed some of his precepts to Pieter de Molyn, Coelenbier, Saftleven, van der Kabel and even Berghem. His life at the Hague for twenty-five years was very prosperous, and he rose in 1640 to be president of his guild. A friend of Anthony Van Dyck and Bartholomew van der Helst, he sat to both these artists for his likehess. His daughter Margaret married Jan Steen, and he had steady patrons in the stadtholder Frederick Henry, and the chiefs of the municipality of the Hague. He died at the Hague in 1656, possessed of land and houses to the amount of 15,000 florins. Between 1610 and 1616 van Goyen wandered from one school to the other. He was first apprenticed to Isaak Swanenburgh; he then passed through the workshops of de Man, Klok and de Hoorn. In 1616 he took a decisive step and joined Esaias van der Velde at Haarlem; amongst his earlier pictures, some of 1621 (Berlin Museum) and 1623 (Brunswick Gallery) show the influence of Esaias very perceptibly. The landscape is minute. Details of branching and foliage are given, and the figures are important in relation to the distances. After 1625 these peculiarities gradually disappear. Atmospheric effect in landscapes of cool tints varying from grey green to pearl or brown and yellow dun is the principal object which van Goyen holds in view, and he succeeds admirably in light skies with drifting misty cloud, and downs with cottages and scanty shrubbery or stunted trees. Neglecting all detail of foliage he now works in a thin diluted medium, laying on rubbings as of sepia or India ink, and finishing without loss of transparence or lucidity. Throwing his foreground into darkness, he casts alternate light and shade upon the more distant planes, and realizes most pleasing views of large expanse. In buildings and water, with shipping near the banks, he sometimes has the strength if not the color of Albert Cuyp. The defect of his work is chiefly want of solidity. But even this had its charm for van Goyen's contemporaries, and some time elapsed before Cuyp, who imitated him, restricted his method of transparent tinting to the foliage of foreground trees. Van Goyen's pictures are comparatively rare in English collections, but his work is seen to advantage abroad, and chiefly at the Louvre, and in Berlin, Gotha, Vienna, Munich and Augsburg. Twenty-eight of his works were exhibited together at Vienna in 1873. Though he visited France once or twice, van Goyen chiefly confined himself to the scenery of Holland and the Rhine. Nine times from 1633 to 1655 he painted views of Dordrecht. Nimeguen was one of his favorite resorts. But he was also fond of Haarlem and Amsterdam, and he did not neglect Arnheim or Utrecht. One of his largest pieces is a view of the Hague, executed in 1651 for the municipality, and now in the town collection of that city. Most of his panels represent reaches of the Rhine, the Waal and the Maese. But he sometimes sketched the downs of Scheveningen, or the sea at the mouth of the Rhine and Scheldt; and he liked to depict the calm inshore, and rarely ventured upon seas stirred by more than a curling breeze or the swell of a coming squall. He often painted winter scenes, with ice and skaters and sledges, in the style familiar to Isaac van Ostade. There are numerous varieties of these subjects in the master's works from 1621 to 1653. One historical picture has been assigned to van Goyen -- the "Embarkation of Charles II" in the Bute collection. But this canvas was executed after van Goyen's death. When he tried this form of art be properly mistrusted his own powers. But he produced little in partnership with his contemporaries, and we can only except the "Watering-place" in the gallery of Vienna, where the landscape is enlivened with horses and cattle by Philip Wouvermans. Even Jan Steen, who was his son-in-law, only painted figures for one of his pictures, and it is probable that this piece was completed after van Goyen's death. More than 250 of van Goyen's pictures are known and accessible. Of this number little more than 70 are undated. None exist without the full name or monogram, and yet there is no painter whose hand it is easier to trace without the help of these adjuncts. An etcher, but a poor one, van Goyen has only bequeathed to us two very rare plates.